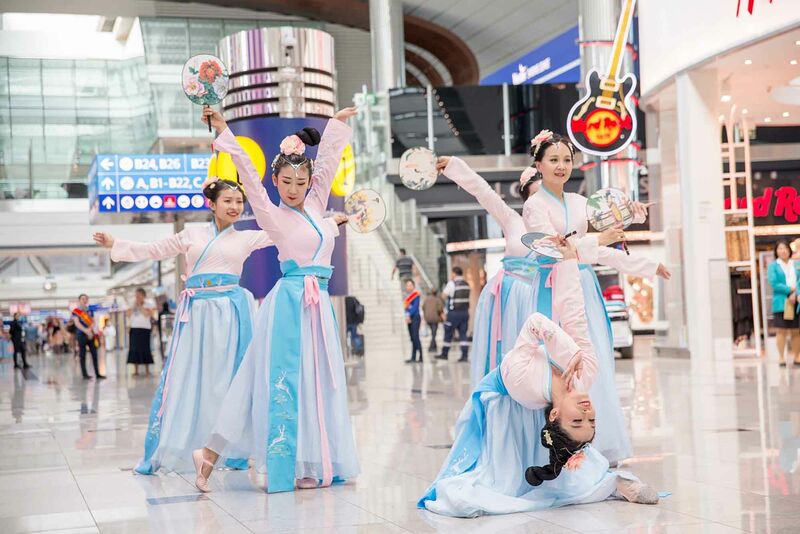 Dubai International has launched a series of events celebrating Chinese culture through art, food, and musical performances. The airport has also taken a number of integrated steps to engage Chinese travellers, from the installation of potable hot water dispensers to the use of Mandarin language for communication. It has also launched digital menus for select restaurants, as well as digital channels such as the airport’s Wow-Fi product, and even a special Mandarin edition of the airport’s popular magazine Time Out DXB. The activities form part of a ‘China Ready’ strategy designed to boost traffic between Dubai and the 13 Chinese destinations served by Dubai International. A growing number of retail and food concessionaires have begun to accept the mobile payment platform Alipay. The airport has also employed several Mandarin-speaking staff (Dubai Duty Free has long had a sizable Chinese contingent among its team). Four dedicated immigration counters at arrivals are hosted by Emiratis fluent in Mandarin. 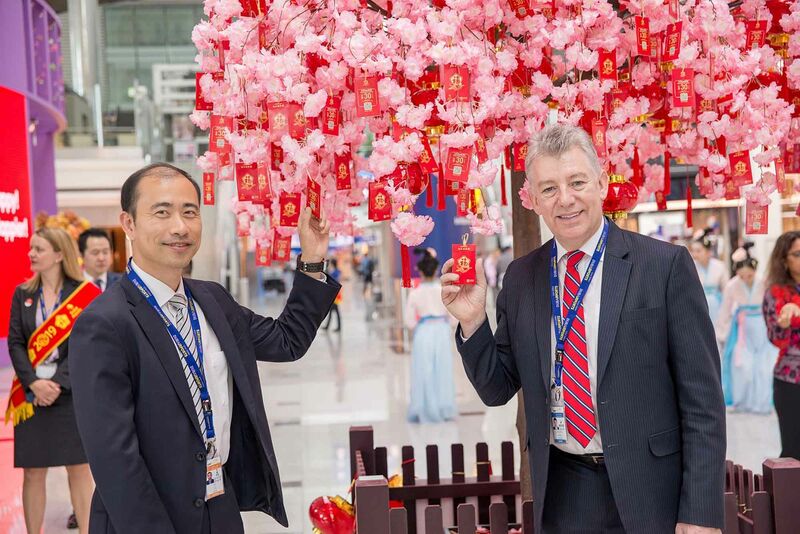 Dubai Airports CEO Paul Griffiths (right) and Lei Jin, Consulate General of the People’s Republic of China in Dubai, mark the Chinese New Year celebrations at Dubai International. A traditional Chinese Palace Dance was performed at Dubai International to launch a week of New Year celebrations. 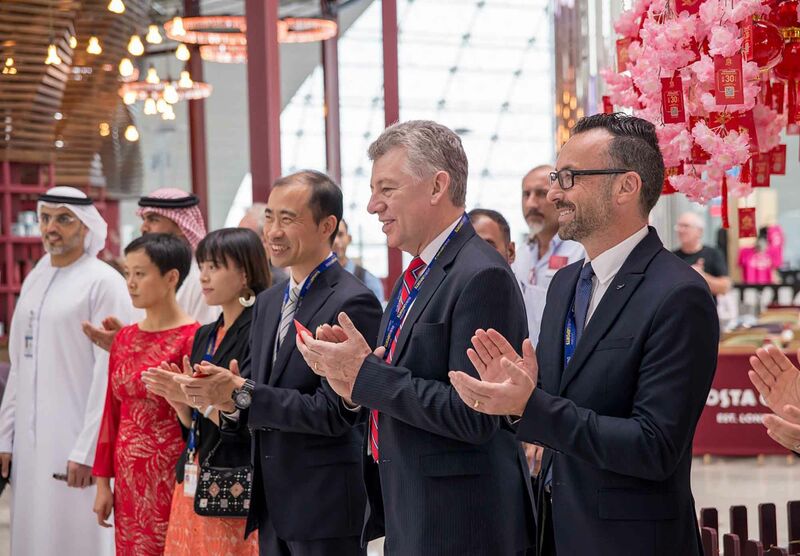 From right to left: Dubai Airports EVP Commercial Eugene Barry; Dubai Airports CEO Paul Griffiths; Economic and Commercial Counsellor Lei Jin; Consulate General of the People’s Republic of China in Dubai Consular Attache Weiyun Deng; and Ant Financial, Alibaba Director EMEA Li Wang. 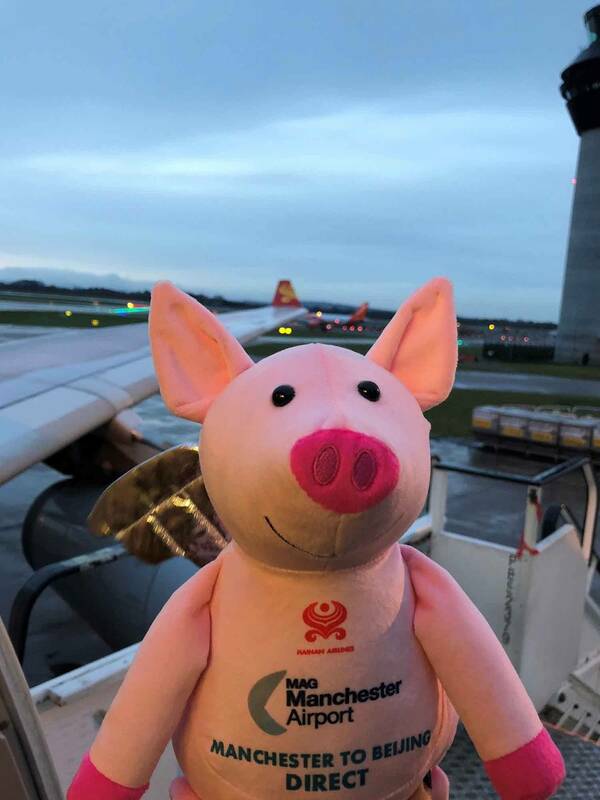 A range of Year of the Pig activities are underway at Manchester Airport in the UK. A Chinese wishing tree has taken root in Terminal Two, giving passengers the opportunity to hang their New Year wishes and desires from its branches. In China, blossom trees symbolise growth, transformation and prosperity. The airport has also unveiled an art exhibition in collaboration with the Centre for Chinese Contemporary Art in the arrivals halls of Terminal Two. 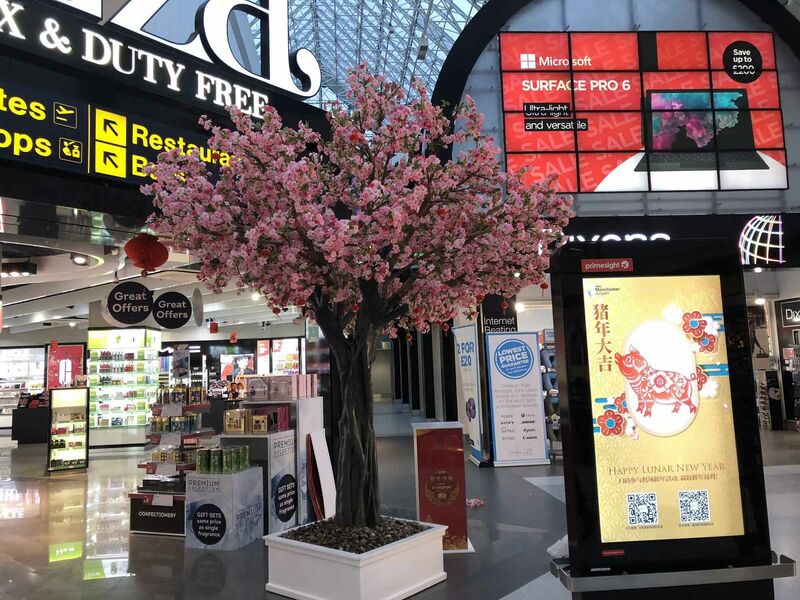 A set of interactive posters with QR codes allow passengers to engage with the airport’s WeChat account, and dozens of Chinese lanterns have been hung throughout all the terminals. Traditional lion dance and Chinese performers will entertain passengers on 5 February, the start of the Year of the Pig, with those arriving and departing getting the chance to receive a lucky pig envelope, with duty free offers inside and prizes to be won. Manchester Airport is also celebrating a 17% year-on-year increase in passenger numbers to China in 2018. 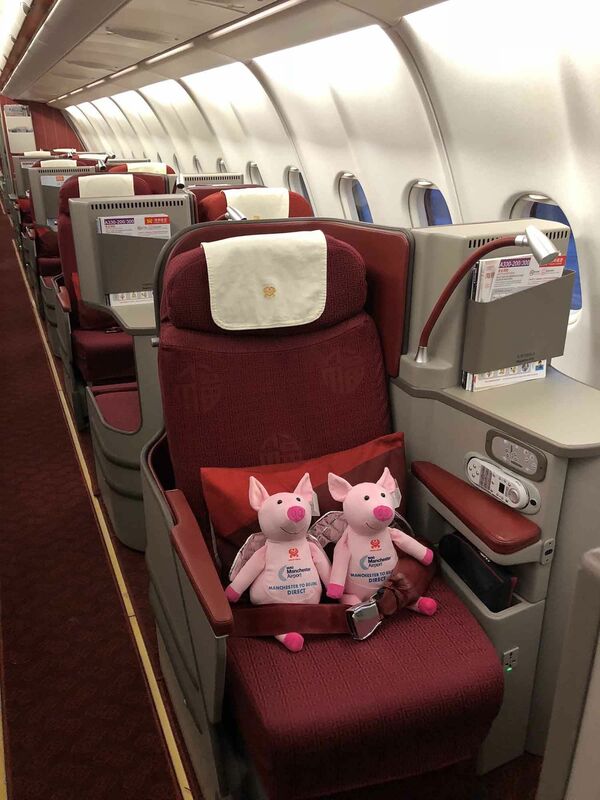 And pigs might fly: Two cuddly Chinese New Year pigs onboard a Hainan Airlines flight from Beijing to Manchester Airport. The route has been operational for two and a half years. Travelling in sty-le: The Manchester-Beijing route has grown faster than any other UK-China route that has been in operation for more than 12 months, the airport said. Growth and prosperity: A Chinese wishing tree has taken root at Manchester Airport's Terminal Two. If you’re going to promote a product that addresses the skincare needs of Chinese travellers, there can’t be many more impactful ways of doing it than creating a branded mock-up airplane. 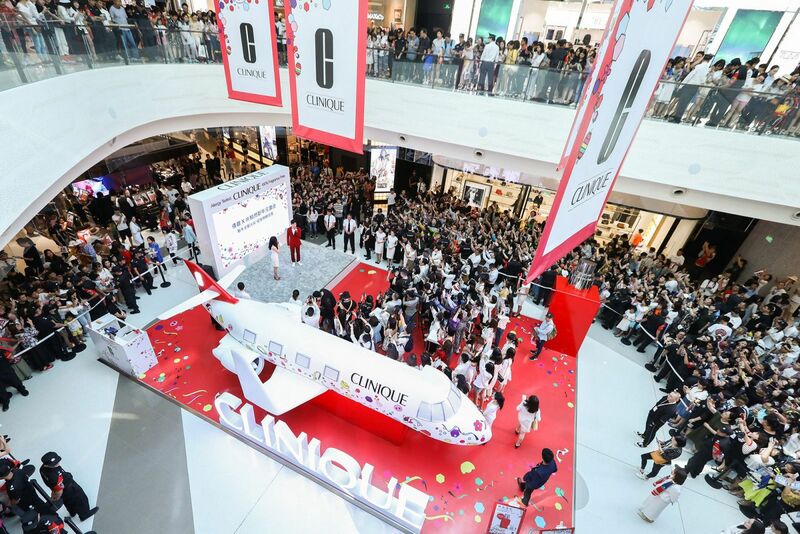 That’s what Clinique did for a spectacular Chinese New Year launch at China Duty Free Group (CDFG)’s Haitang Bay store in Sanya. The event featured Chinese heartthrob Jing Boran (also the local Brand Ambassador of the Estée Lauder Companies-owned skincare label), who unveiled a limited-edition Clinique travel-exclusive under his name. What a way to launch Chinese New Year and a related festive exclusive. Expect rapid take-off. All onboard for Clinique: This spectacular installation was the centrepiece of the brand’s Chinese New Year celebrations. 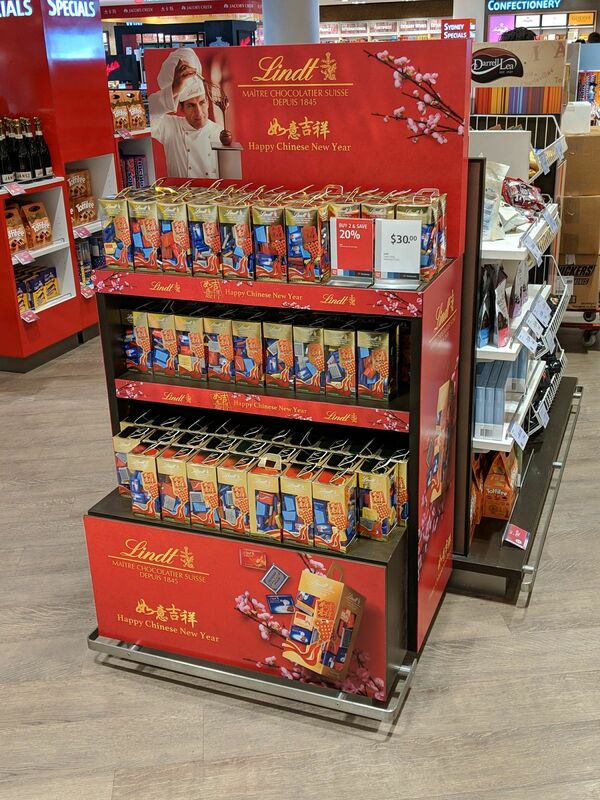 Lindt & Sprüngli Travel Retail has created a range of travel exclusive Chinese New Year gifts, including a special edition of Lindt Napolitains in a collectable sharing box featuring the Chinese symbol for good luck. The Chinese New Year range is being supported by colourful displays across key travel sites including Hong Kong, Shanghai, Hainan Island, Taipei, Singapore, Bangkok, Kuala Lumpur, Vietnam, Cambodia, Melbourne and Sydney. 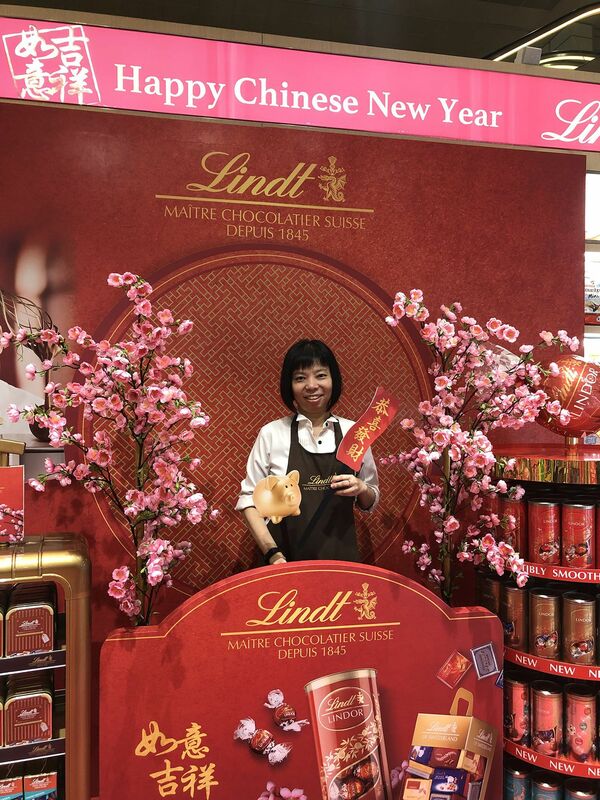 Lindt & Sprüngli Travel Retail's Chinese New Year displays prominently feature cherry blossoms, which represent the promise of spring and a renewal of life.